"What Does the Church Teach About Satan and Demons?" "What Does the Church Teach About Satan and Demons?" Scripture tells us that angels and demons (especially Satan) are spiritual creatures gifted with intelligence, will, freedom, and initiative. Those modern theologians who identify Satan as an abstract idea of evil are completely mistaken. Theirs is true heresy; that is, it is openly in contrast with the Bible, the Church Fathers, and the Magisterium of the Church. The truth about Satan was never doubted in the past; therefore, the only dogmatic definition in this respect is this statement from the Fourth Lateran Council: "The Devil [that is, Satan] and the other demons were created good by God; but they became evil through their own fault." Whoever denies the existence of Satan also denies sin and no longer understands the actions of Christ. Scripture talks to us about the Kingdom of God but also of the kingdom of Satan. It is impossible to understand the salvific action of Christ if we ignore the destructive action of Satan. The truth of salvation is this: Jesus came "to destroy the works of the Devil" (I Jn 3:8), to free man from Satan's slavery, and to establish the kingdom of God after destroying the reign of Satan. However, between the Birth of Christ and the Second Coming of Christ, the Devil tries to entice as many people as possible to his side. Therefore, Paul tells us that "we are not contending against flesh and blood, but against the principalities, against the powers, against the world rulers of this present darkness, against the spiritual hosts of wickedness in the heavenly places" (Eph 6:12). Let us be clear about this: Jesus defeated Satan through His sacrifice. However, Jesus also defeated Satan before His death, through His teachings: "If it is by the finger of God that I cast out demons, then the kingdom of God has come upon you" (Lk 11:20). Jesus first gave the power to cast out demons to His apostles; then He extended the power to the seventy-two disciples, and in the end He granted it to all those who would believe in Him. How can those who deny the existence and the many activities of Satan understand the achievements of Christ? How can they understand the value of the redemptive death of Christ? On the basis of Sacred Scripture, the Second Vatican Council affirms that "Christ, by His death and resurrection, has freed us from the power of Satan". 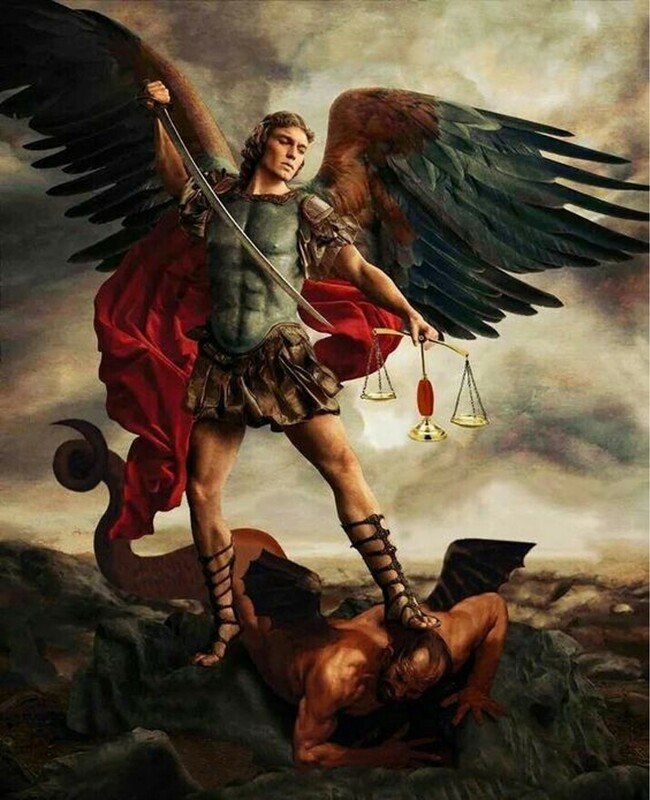 During a May 24, 1987, visit to the Sanctuary of Saint Michael the Archangel, John Paul II said, "The battle against the Devil, which is the principal task of St. Michael the Archangel, is still being fought today, because the Devil is still alive and active in the world. The evil that surrounds us today, the disorders that plague our society, are not only the results of original sin, but also the result of Satan's pervasive and dark actions." Revelation tells us that demons were hurled down to earth; therefore their final damnation has yet to happen. That is why they asked Jesus, "Have you come here to torment us before the time?" (Mt 8:29). How can we defend ourselves from Satan and his demons? By prayer, the Sacraments, almsgiving, leading a Christian life, pardoning offenses, and soliciting the aid of our Lord, Mary, the saints, and the angels. Let me end here by speaking about the angels. They are our great allies! Each of us has a guardian angel, the most faithful of friends—who is with us twenty-four hours a day, from conception to death. The believer who lives in the presence of the Trinity and is certain of God's life within himself knows that he also has God's own Mother, who ceaselessly helps him, as well as the help of the angels and of the saints. Therefore, how can we feel alone, abandoned, or oppressed by evil? In the life of the believer there is pain, because it is the Cross that saves us, but there is no room for sadness. He who believes is always ready to give witness to those who ask him about the hope that sustains him (I Pet 3:15). (Note: For many years, Fr. Amorth was the Chief Exorcist of Rome—until his death on September 16, 2016, at the age of 91. He said that, during his exorcisms, the names he invoked that the demons most hated to hear were the Blessed Mother, followed by Pope St. John Paul. Fr. Amorth wrote two books about his thousands of exorcisms).